Take a sneak peek behind-the-scenes at the Orchid Show, the Chicago Botanic Garden’s biggest flower show of the year. Buy tickets here. We’ve rolled out the tall ladders, prepped hanging baskets with Spanish moss, and worked hard to keep 10,000 warmth-loving tropical orchids happy (including an orchid that is rarely shown in the United States, Phalaenopsis Sogo Yukidian ‘V3’; be sure to check out the unusual number of big blooms on each spike). It’s all hands on deck for the Show, which runs February 11 to March 26, following the Members’ Preview night on Friday, February 10. Volunteers across the Garden and beyond have pitched in to help from departments including Education, Model Railroad, and Horticultural Therapy Services, along with our Woman’s Board. 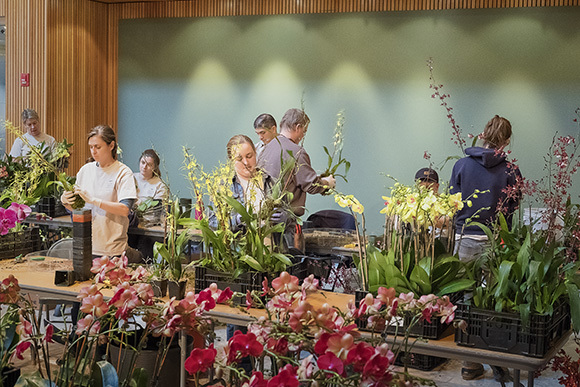 Volunteers from different departments unpack orchids for the Orchid Show 2017. 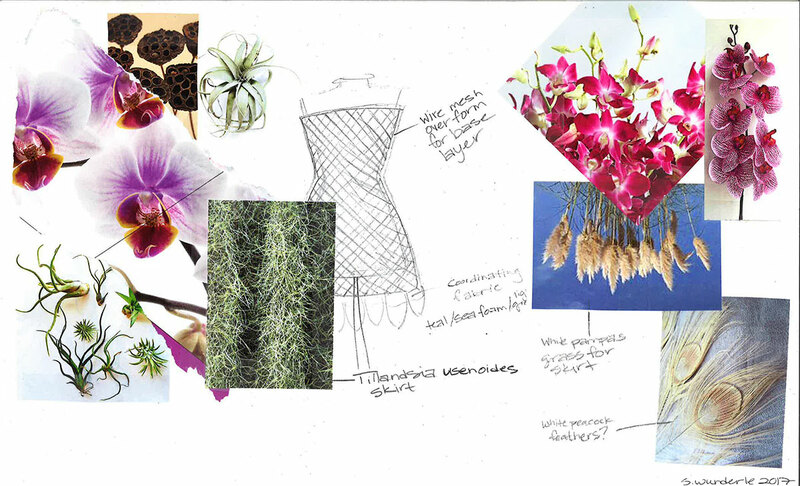 It all starts with ideas from our creative team, which starts brainstorming shortly after the end of the previous year’s Orchid Show. 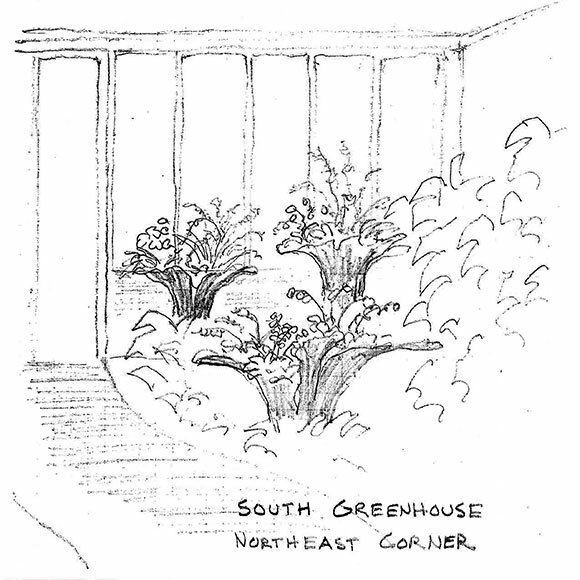 Last June, horticulturist Brian Barker had an idea that looked like this. 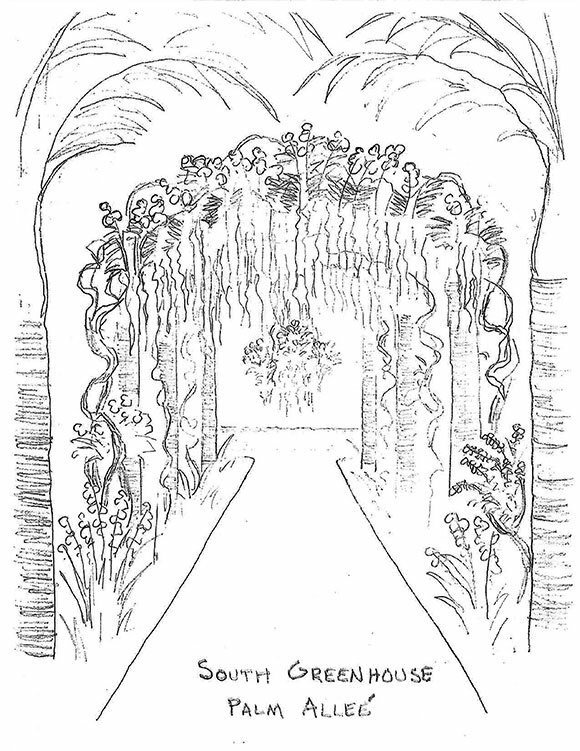 Now it looks like this: an arch of Vanda and Oncidium orchids between the palms. Three big planters are nestled amid the existing greenhouse plantings. Manzanita branches cover the framework of the planters; orchids will fill the top and stem of the structures. In the completed archway, supporting vines are woven together and attached to a hidden framework. Notice the dangling aerial roots from orchids that are epiphytes—plants that grow on trees, with above-ground rather than in-ground roots. Sometimes, things don’t always go as planned. Work on the 13-foot high orchid “wind chime” got delayed while we waited and waited for a delivery of bamboo supports from Colombia… Luckily, the shipment arrived before the Show. When you walk into Nichols Hall, don’t forget to look for the dozens of blooms overhead. This year’s theme is Orchids in Vogue, a playful look at the influence of orchids in popular culture, including fashion. 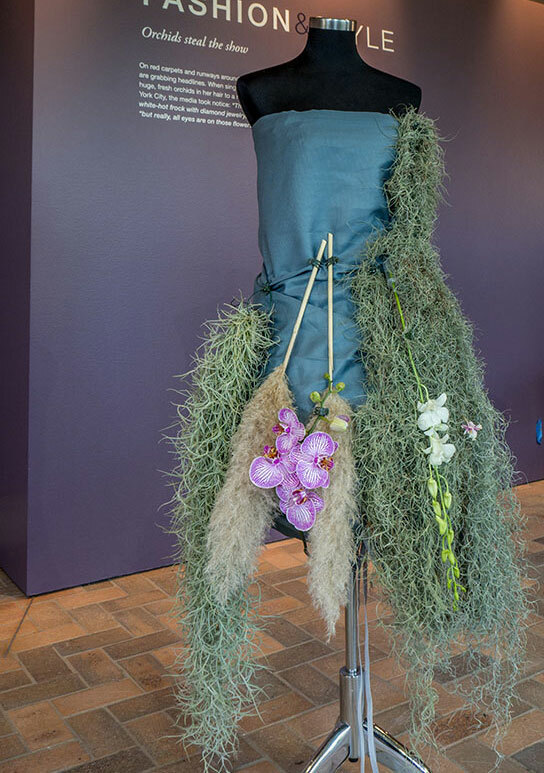 Last summer, senior horticulturist Salina Wunderle came up with an idea for an orchid “dress.” Now we have three design teams working on orchid dresses; come see the final result. 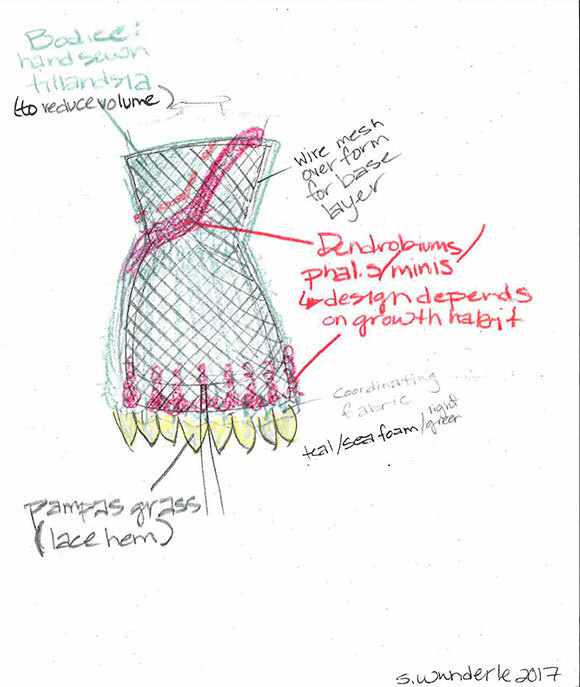 Salina’s dress sketch shows how her material choices will be layered to create the final look. The availability and maintenance of the plants might mean some changes in the final design. We did some trial runs, testing materials to help determine weight and structure, and making sure they’ll stay fresh for the run of the Show. Don’t miss our exclusive Members’ Preview night, Friday, February 10. 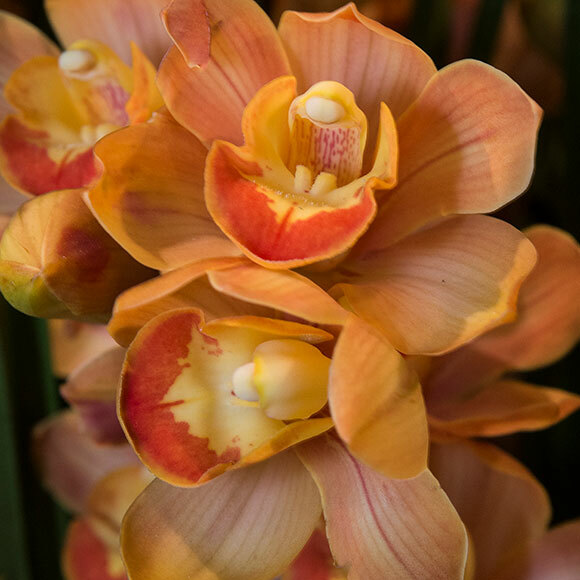 Visit the Orchid Show February 11 to March 26, 2017. Photos by Maria Rebelo and Robin Carlson. I love orchids and the pictures enclosed are lovely. 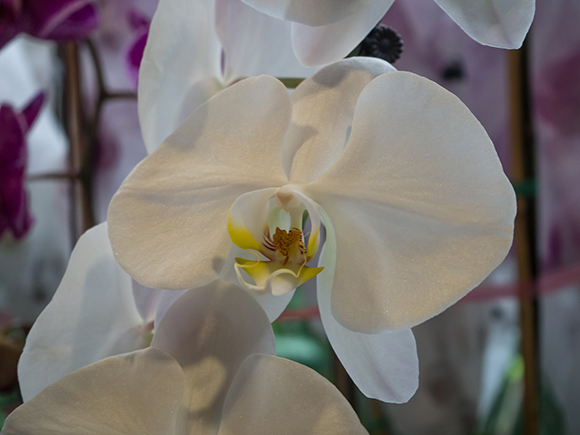 Orchids can be sturdy when left indoors for long periods of time. I must say the orchid wind chime enclosed here looks beautiful – such a talented and colorful creation! 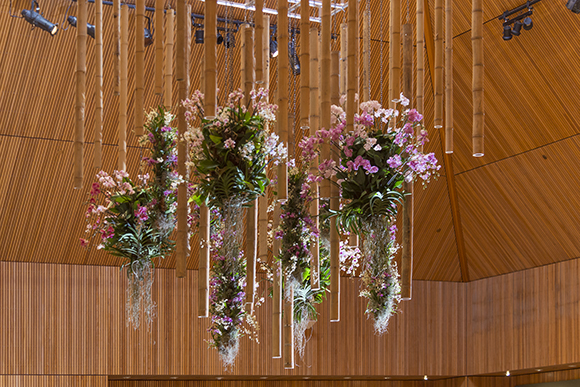 How did they manage to set the orchids on those bamboo chimes? It must have taken a lot of thinking to make this happen. 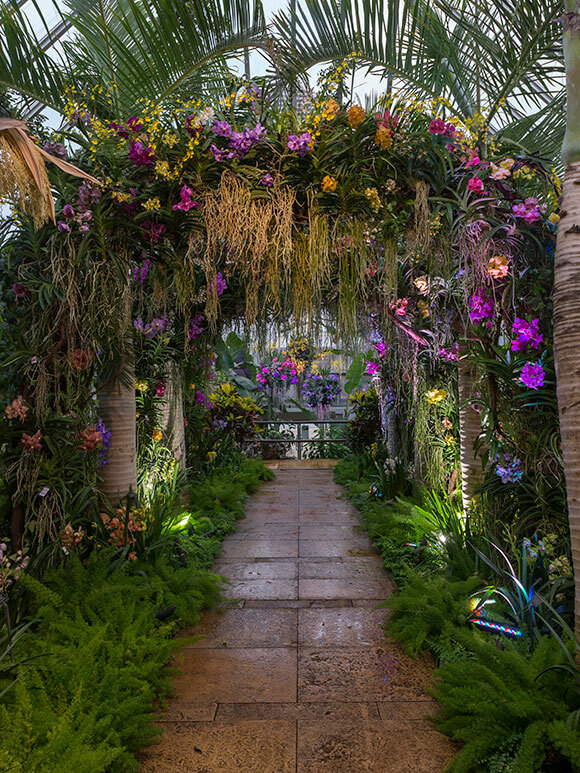 Also, the arch of Vanda and Oncidium orchids between the palms add to a romantic statement. 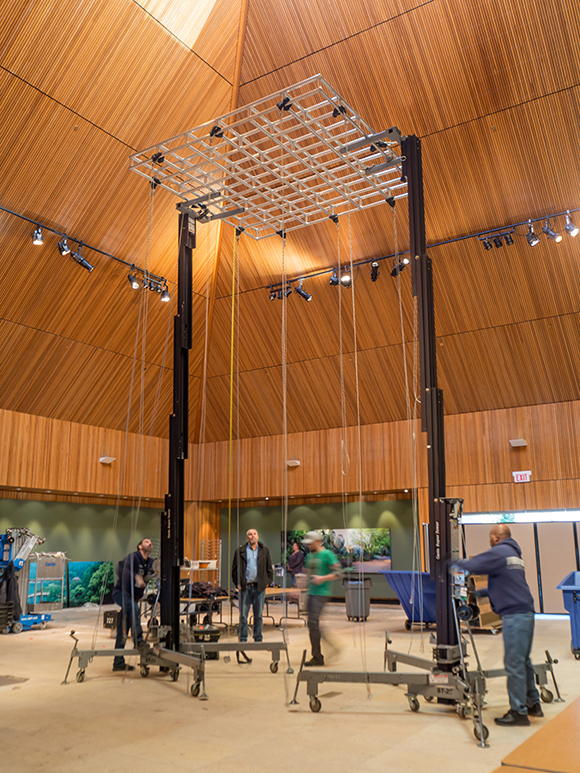 Here’s what Gabriel Hutchison, exhibitions and programs production manager, said about the wind chime: “The small Oncidium Twinkles and small Phalaenopsis are actually attached to aluminum structures that are made up of alternating and ascending rings. 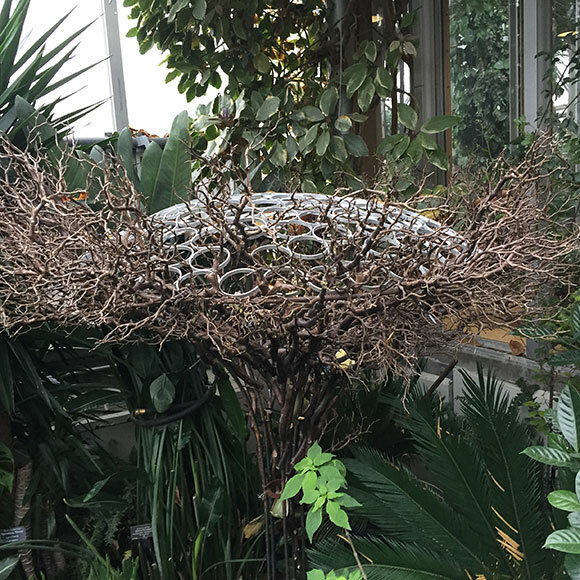 The larger Phalaenopsis and Vanda orchids are attached to a metal basket structure that is filled with moss to retain moisture at that height. Since the smooth surface of bamboo would make it tricky to adorn with orchids, we left the bamboo poles natural to complement the chains and baskets of orchids. We’ve forwarded your question to our Plant Information Service; they should have a reply shortly. If you want to use them again at any time, you can post your question to them on Facebook at https://www.facebook.com/plantinfo.chicagobotanicgarden/ or contact them directly at plantinfo@chicagobotanic.org or (847) 835-0972. Thank you! Mold growing on the surface of the soil is an indicator that the plant is being kept too wet. Clivia appreciate a moderate watering schedule from spring to autumn. Water sparingly in the winter. The plant will need to be repotted in fresh orchid potting mix. Dispose of all potting soil/bark mix that was in the pot and wash the pot thoroughly. If the plant is blooming or ready to bloom, wait until it is finished to transplant. Plants like to be pot-bound so make sure that your new container is not too large and has good drainage. Please contact plantinfo@chicagobotanic.org if you have additional questions.